Stacy Santini, Founder/CEO, The Poetry Connection, helps the residents at McPeak's Assisted Living create their own poem during a visit to McPeak's on October 9. On October 9, McPeak's Assisted Living welcomed The Poetry Connection's Founder/CEO, Stacy Santini, to teach its residents how to express themselves by writing poetry, using music and singing. Residents learned about the American poet Robert Frost and listened to Ms. Santini's recitation of his famous poem "The Road Not Taken" and listened to music. The residents were later asked about the emotions they felt and the memories they had while listening to music. 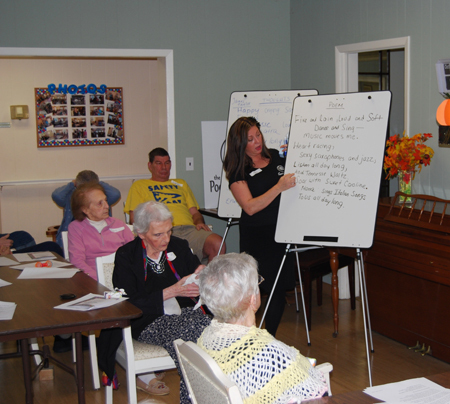 With the help of Ms. Santini, the residents created a poem called "Musical Memories." The poem is scheduled to be published in a collection of other poems that were created by residents at other local assisted living facilities and nursing homes. The Poetry Connection combines poetry with the arts to create an educational yet entertaining experience for the elderly. Prior to founding The Poetry Connection, Ms. Santini performed poetry readings to the Port Jefferson Rehabilitation Clinic's residents. After discovering that she enjoyed visiting the residents and reading poetry to them, she decided to design a program that would encourage creativity and mental stimulation among rehabilitation and nursing home residents.